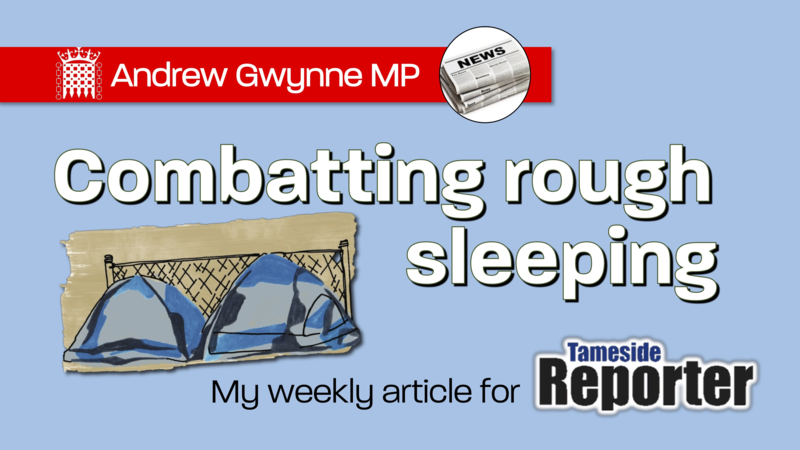 Anyone living in Greater Manchester will have seen that there are more people sleeping rough on our streets. This isn’t a problem that is unique to Manchester. Just before Christmas, MP’s received the tragic news that a man who had been sleeping rough at the doors of Parliament had passed away. This is the second time that this happened in the past year. This is a national problem, but where the Government are continuing to fail, dedicated public servants across Greater Manchester are putting forward radical ideas to end this crisis. Mayor Andy Burnham has made the crisis of homelessness one of his key policy priorities, aiming to end the need for rough sleeping in Greater Manchester by 2020. The first step has been the ‘Bed Every Night’ scheme, that has already helped more than 1,600 people helped in little over three months. Earlier this month, temperatures dropped and we saw the coldest night of the year. Rough sleeping in Manchester is now 25 times higher than it was in 2010, but through the Bed Every Night scheme a safe place to sleep was found on that cold night for all that needed somewhere warm and safe to sleep. Last week, the Mayor visited a local project in Audenshaw that is not only providing homeless people with a place to safely sleep, but to find advice, help and support to move off and stay off the streets before the cold weather returns. The success of the project across Manchester, has led to the project being extended until the end of April. All we need now is the same leadership from the Government, and we can finally bring an end to the national shame of soaring homelessness.